In my new book, Ally-saurus & the Very Bossy Monster, I illustrate Ally's love of all things dinosaur by drawing imaginary dinosaur spikes, claws, and tail over Ally's black and white image using pink crayon (just as I did in the first book, Ally-saurus & the First Day of School). In this new story, Ally and her friends must contend with a rather bossy girl named Maddie who insists Ally and company play monsters with her. As with Ally's dino-persona, I illustrate Maddie's imaginary monster persona using a crayon line around her image-in this case, green . While still writing the book-long before my first sketch-I pictured Maddie's imaginary monster looking like one of the Wild Things in Maurice Sendak's classic, Where the Wild Things Are. As a self-taught illustrator, my formal training consisted of buying a lot of books and staring at the illustrations until I unlocked their secrets. Included in that collection was a used copy of The Art of Maurice Sendak. I read that book over and over again, finding the chapter on Where the Wild Things Are particularly insightful. 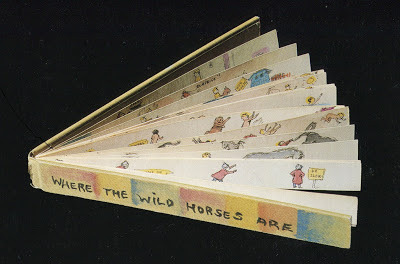 Among other things, it contains a pop-out copy of the original book dummy, titled, Where the Wild Horses Are. Sendak only changed it to "wild things" after he realized he couldn't draw horses (thank God!). As I began my preliminary sketches for the second Ally-saurus adventure, I decided to stick with my original idea of Maddie's imaginary monster echoing Sendak's Wild Things as a silent homage to the children's book legend. After dozens of sketches I finally hit on a combination of Wild Thing characteristics that seemed to suit Maddie perfectly. 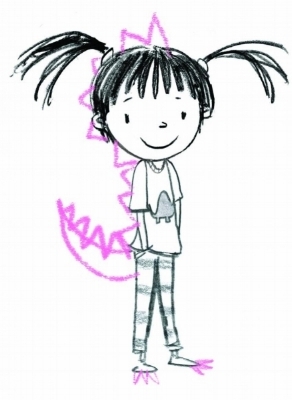 Like many of the Wild Things, Maddie's imaginary monster would have horns. It would also have long hair like the duck-footed Wild Thing, the fur, feet, and paws of the bear/gnome Wild Thing, with a tail as long as the striped Wild Thing but shaped like the bull-faced Wild Thing. To top it all off, Maddie's imaginary monster would have a crown-like Max's! In studying The Art of Maurice Sendak, I also learned that Sendak gradually expanded the size of the illustrations in Where the Wild Things Are to symbolize Max's deeper absorption into his own imagination. The illustrations then reverse course, gradually growing smaller as Max begins to miss his home. This symbolizes the fading of Max's imaginary world as he returns to the real one. As part of my homage to Sendak, I worked this technique into Ally-saurus & the Very Bossy Monster, once again through Maddie. As her bossy behavior continues unchecked, I illustrate Maddie's growing self-absorption by expanding her imaginary monster world, including bubbling pools of ooze, haunted trees, and slugs. At the same time, I greatly increase the size of her crown and horns. Then, when Ally-saurus finally finds her voice and stands up for her friends (and herself), Maddie's imaginary monster world quickly shrinks, as do her crown and horns. Both the look of Maddie's monster persona, as well as the technique of manipulating the size of her crown, etc. worked perfectly for the story. Had they not, my silent tribute to Mr. Sendak would have had to wait for another book. This isn't the first time I have honored someone who has influenced my work. I'll talk about that in an upcoming post. 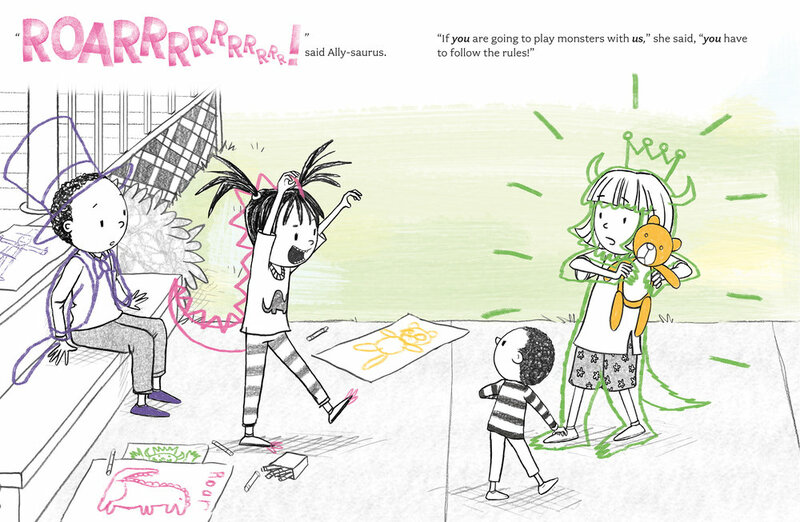 School Library Journal calls ALLY-SAURUS & THE VERY BOSSY MONSTER whimsical, clever, and effective! PreS-Gr 1 –Ally-saurus is back—“ROAR!” Ally, Kai, and his little brother Petey love playing together. Ally stomps and roars like a dinosaur. Kai dances across the porch stage, and Petey says “Bear!” while holding his teddy bear. Much fun and laughter is had until new neighbor Maddie intercedes. When Maddie comes back during their “super, amazing monster dance,” she takes one look at the fun and decides to join without a word about her rules. Later at the bus stop when Maddie start ruling, one “Roar!” from Ally-saurus reminds her that fun can be had without being bossy. Torrey matches his spot-on text with even better illustrations. Using the same technique he employed in Ally-saurus & the First Day of School, Torrey uses pencil drawings with colorful crayon-like additions (dinosaur spikes and tail, tux and top hat for dancing, etc.) to deftly make the alter egos visible to readers. See the review at School Library Journal by clicking here. I find this fascinating. James Castle was born September 25, 1899, in the small mountain town of Garden Valley, Idaho to Francis J. Castle and Mary Nora Scanlon. Profoundly deaf from birth and did not attend school until he was ten years old, when he was enrolled at the Gooding School for the Deaf and Blind in southeastern Idaho. At a very early age Castle began drawing and making things with found materials. Throughout Castle’s lifetime, nearly everything that crossed his path inspired or influenced him. His daily ritual included checking all the trash containers in the home and throughout the immediate neighborhood. Depending entirely on his ingenuity, Castle fashioned materials such as sticks, apricot pits and broken fountain-pen nibs into tools he could use to create. He discovered he could scrape soot from the wood-burning stove and spit into the powdery substance to mix a black ink suited for his diverse imagery. He often derived color by squeezing pigment from saturated crepe paper. Family members gave him store-bought art materials such as oil sticks and watercolors, and he incorporated these new materials into his own self-made concoctions to produce the many subtle textures and colors found in his work. 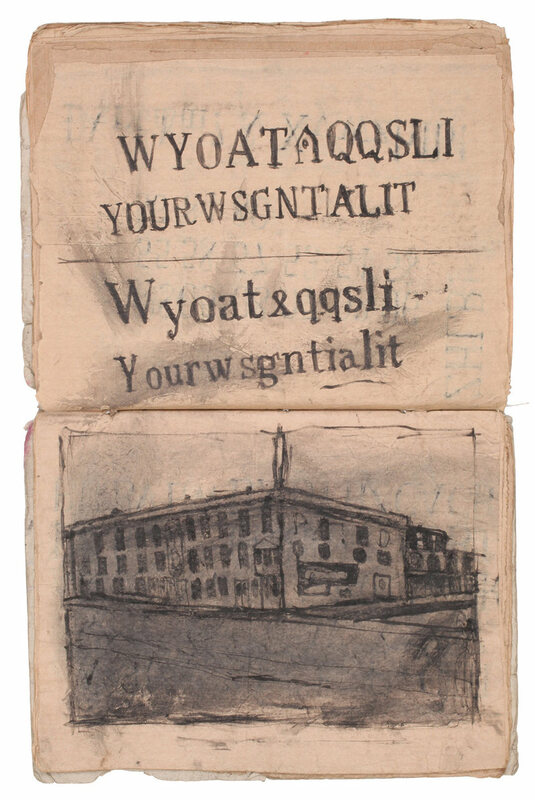 On paper scraps, he captured even the details of doorknobs, windowsills, washbasins and framed portraits of ancestors. Over the years, he tucked batches of his drawings into crannies around the house and the outbuildings. In the 1950s, Castle’s nephew, Bob Beach, came home on a break from the Museum Art School in Portland, Oregon. Beach suggested to family members that Castle’s drawings, handmade books and constructions could be called “art.” Beach was allowed to take some of his uncle’s drawings back to the Portland art school to show his professors. This introduction launched the beginning of Castle’s recognition as an artist in regional museums and art galleries. Throughout history, how many other James Castles have come and gone without ever having been "discovered"? To read more and find links to his archives click here. I've now written/illustrated 15 books and have been reviewed hundred's of times. That said, I can't remember a reviewer "getting me" in a way that Tonja Drecker did in her wonderful Bookworm for Kids review this week of ALLY-SAURUS & THE VERY BOSSY MONSTER. I know that doesn't mean much to those who may be reading this, but as someone who spends a year or more thinking nonstop about a story-the writing, the illustrations, the cover, the end pages, and even after that continues to tweak it until it's finally ripped out of my hands because of deadlines-it means everything. "The power of imagination combines with an enthusiastic heroine to tame even the fiercest monsters of reality. Ally and her friends love to pretend, and each has a favorite role they slip into--dinosaurs, a performer, and a bear. . .kind of. The three have so much fun until the new girl in the neighborhood, Maddie, steps in and wants to lay down tons of rules. All of which serve her purposes, of course. Ally and her friends want to be nice and try to play along, but at one point, things get out of hand. Imagination flows from every page, letting its magic unfold as Ally and her friends are swallowed up in their own delightful worlds..."
Continue to read the review by clicking here. I highly recommend this article in THE ATLANTIC by Jean M. Twenge. Those mall trips are infrequent—about once a month. More often, Athena and her friends spend time together on their phones, unchaperoned. Unlike the teens of my generation, who might have spent an evening tying up the family landline with gossip, they talk on Snapchat, the smartphone app that allows users to send pictures and videos that quickly disappear. They make sure to keep up their Snapstreaks, which show how many days in a row they have Snapchatted with each other. Sometimes they save screenshots of particularly ridiculous pictures of friends. “It’s good blackmail,” Athena said. (Because she’s a minor, I’m not using her real name.) She told me she’d spent most of the summer hanging out alone in her room with her phone. That’s just the way her generation is, she said. “We didn’t have a choice to know any life without iPads or iPhones. I think we like our phones more than we like actual people.”...Continue reading by clicking here. I recently unearthed what may be my earliest surviving drawing…at least that I’m willing to show. Ironically, it’s a dinosaur. Apparently I drew this at age 3 and a half, while watching my older brother draw dinosaurs for a school project. With my next book being about a girl who sees herself as a dinosaur, I thought it was fitting that I share it. When speaking to groups, I often point out that young children- when drawing, singing, dancing, or doing whatever floats their boat-don't care whether what they’re doing is worthy of publication or slot on America’s Got Talent. At that age we all draw, sing, dance, etc. simply because it’s fun…it feels good. Somewhere along the way, we begin to pay attention to criticism from others and start to become critical of ourselves. There is nothing wrong with this, as it tests our love of a particular activity, and helps to spur growth in a talent. At the same time, it signals the end of doing something (bad or good) purely out of the joy of doing it. As an exercise, try tapping into to that mindset, when you were 3 and a half-completely free from any critical thinking-and create something simply because it’s fun…because it feels good. As with all books-oodles of concept sketches and experiments with color preceded the final cover art for ALLY-SAURUS & THE VERY BOSSY MONSTER. Thomas Oppong's Medium Post: "Genius Takes Time And Extraordinary Effort"
Once again, Thomas Oppong has written a fantastic piece for Medium, entitled: Genius Takes Time And Extraordinary Effort. Those in a creative field who are unfamiliar with Oppong's writing, I can't recommend him strongly enough. This is one of the best articles I have read in a long time on creativity and the pursuit of excellence. Anyone in business for themselves or in a creative endeavor will find this useful. A reoccurring theme-in this and many other articles like it- is the importance of maintaining a robust curiosity in the world around us. "...Hungarian photographer Brassaï once asked Picasso whether his ideas come to him “by chance or by design,” and Picasso responded: “I don’t have a clue. Ideas are simply starting points. I can rarely set them down as they come to my mind. As soon as I start to work, others well up in my pen. To know what you’re going to draw, you have to begin drawing… When I find myself facing a blank page, that’s always going through my head. What I capture in spite of myself interests me more than my own ideas.”...."
"...it’s a story that advocates for defending one’s passions and running wild with them..."
I first posted this picture on my Facebook page in May of 2016 with the caption, "staring at a blank page, beginning the long-sometimes painful-but always exhilarating-process of turning a spark into a story..."
I then struggled for two months only to create a hash of a story which I subsequently buried next to the many other "misses". Having gone through this process many times, I know the best thing you can do sometimes is to put the story away in order to let it "ripen"...for a month...a year...sometimes ten. I probably have a hundred stories, or pieces of stories that I worked on for days, months, or in some cases years. Sometimes when I pull them out again, they will have indeed ripened. Other times...not so much-still rotten. If there is one thing that separates an amateur from a professional, it is the massive amounts of time invested-with absolutely no guarantee of a positive outcome. It is understood going in that it often won't end well. iIt's a tightrope walk without a net. That said, if you put in the work, learn from the gazillion mistakes you will make, and stay with it, you get better at generating ideas. You get better at fleshing them out. You get better at sensing whether you have something that is worth the investment of your time. You also start to love that tightrope. So, the story I posted about last May-and buried last July...well, I dug it up last month, ripped out much of what was rotten (most of the story), and just put the finishing touches on a new version-and Sue likes it!!!! (which is always the first test). Time to send it off to my agent. I'll let you know if anything happens. FIRST LOOK AT MY NEW BOOK! Arriving home late Tuesday night, I was greeted with a package containing an advance copy of ALLY-SAURUS & THE VERY BOSSY MONSTER. Having started the process of brainstorming ideas for this book 18 months ago, the feeling of holding the finished product in my hands is indescribable. On Monday, the book trailer for Ally-saurus & the Very Bossy Monster premiered on KidLitTV along with a wonderful writeup. KidLit TV is proud to premiere the book trailer for ALLY-SAURUS & THE VERY BOSSY MONSTER by Richard Torrey, the sequel to the award winning ALLY-SAURUS & THE FIRST DAY OF SCHOOL! Your kids will love the humor and fun in this book as well as the unique characters and illustrations! 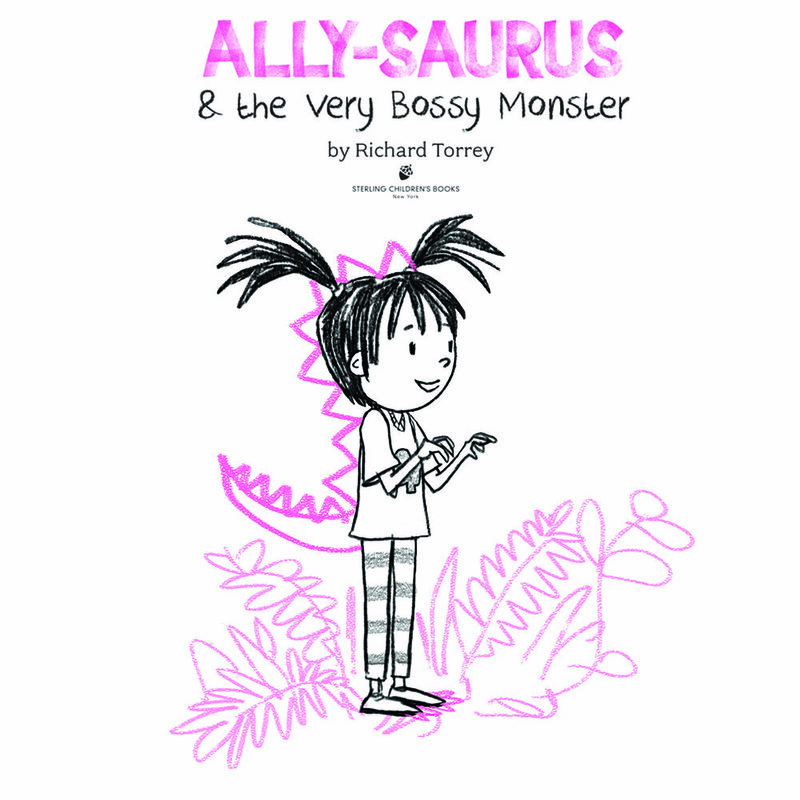 WONDERFUL FIRST REVIEW FOR ALLY-SAURUS & THE VERY BOSSY MONSTER! The tiny tot–turned-dinosaur (in her imagination) is back, this time facing a new challenge: a domineering friend. Yesterday marked the passing of a legend, Frank Deford. He was a brilliant writer and editor, a visionary, and a showman. In 1989, I ended my first comic strip, Hartland and began doing editorial cartoons and story illustrations for the brand new sports daily-The National. Frank Deford was the editor. It was great exposure, wonderfully challenging work, insane deadlines...but they paid VERY well...which is why they only lasted two years. To this day, it was the most fun I've ever had doing what I do. Toward the end of The National's run, Deford asked me to create an exclusive sports comic strip-which I did. Days after getting editorial approval for the strip (called Benchwarmers), The National went belly up. I subsequently changed the name of the strip to Pete & Clete and sold it to Creators Syndicate in LA. RIP Mr. Deford. Thank you for the wild ride. Read more about Frank Deford in the NY Times by clicking here. Below is the brand new book trailer I have created for my book, THE ALMOST TERRIBLE PLAYDATE. It is the first trailer I've ever done for any of my 14 books. My aim was to produce something simple and straightforward, allowing the children's expressions to help tell the story, precisely as I had done in the creation of the book. The book trailer debuted last week on the Mundie Kids blog, which included a wonderful review of the book and has since been featured on KidlitTV. Recently I was interviewed by Sara Grochowski for her wonderful blog, The Hiding Spot (a blog dedicated to books...the best hiding spot I've ever found). I'm thrilled to share an interview with talented and very kind Richard Torrey, whose newest picture book, The Almost Terrible Playdate, is in stores now! Hiding Spot: I feel the plot of the The Almost Terrible Playdate is one that everyone, no matter their age, can relate to. Was there a specific experience that inspired the concept of this book? RT: The original idea for this book can be traced back to a day I watched my children and their friends draw with chalk on our driveway. It suddenly dawned on me that child’s play is really a series of negotiations-proposals and counterproposals. "THIS KID REVIEWS BOOKS" Gives The Almost Terrible Playdate Five out of Five Bookworms! What I Thought- I loved the story. The dialogue between the two characters are funny, and extremely realistic – Mr. Torrey really captures the sense of two very different kids playing together. The illustrations are unique as most of the page is taken up by a thought bubble, and the image inside the bubble looks as if it were drawn by a little kid – reflecting the imagination of a child. I also like the book because it is all conversation – there is no narration. The Website AS THEY GROW UP calls THE ALMOST TERRIBLE PLAYDATE "Adorable"! The Almost Terrible Playdate is an adorable little book about two children that can’t seem to get a long, which is very much how my boys can be some days. They are the best of friends, but let’s face it. They are two different people and obviously they want to play different things. Luckily in the end, it all works out and they compromise which is what happens in this adorable book....Read the rest of the review by clicking here. Booklist Calls THE ALMOST TERRIBLE PLAYDATE "A Playful and Accessible Introduction to Cooperation." 14 days until the release of my next book, THE ALMOST TERRIBLE PLAYDATE. Yesterday it was selected as one of Amazon's Best Books of the Month of February. Today, Booklist published it's review, using words like charming, valuable, entertaining, and playful to describe the book! THE ALMOST TERRIBLE PLAYDATE Torrey, Richard (Author) , Torrey, Richard (Illustrator) Feb 2016. 40 p. Doubleday, hardcover, $16.99. (9780553510997). Today I received word that my new book, THE ALMOST TERRIBLE PLAYDATE has been selected as one of Amazon's Best Books of the Month for February. Exactly one year ago today, my brother-in-law Phil Harnick suffered a devastating heart attack. The completion of my book coincided with his passing. I have dedicated the book to Phil's memory. It is a small gesture, but done with deep love and admiration, not only for Phil, but for his wife Janet, for their two beautiful children Cole and Ty, for his parents Yvonne and Jack, for my brother-in-law Jack and his family, and last but never least for his sister-my wife, Sue. We all miss you Phil.